Whether you’re getting ready to join the raw food movement or a seasoned raw foodist, let The Raw Kitchen take you on a delicious journey to wellness and joy. 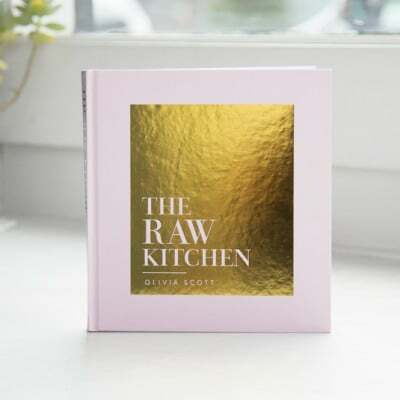 Known for her incredible raw cakes, author Olivia Scott of The Raw Kitchen brings you over 100 amazing gluten-free, dairy-free, refined sugar-free recipes to nourish you from breakfast to dinner, entertaining to drinks — there are raw recipes for every occasion. The Raw Kitchen recipes offer clear, step-by-step instructions and prove that you don’t have to spend all day in the kitchen to enjoy nutritious, delicious raw food that is full of colour and energy. This helpful recipe book also gives instructions on setting up your raw kitchen, lists raw ingredients and their health benefits, and provides lifestyle advice and a detox plan. Let the passion and energy that shines out of The Raw Kitchen inspire you to eat fresher, cleaner, and better.